label QS:Lde,"Erzherzog Leopold Wilhelm in seiner Gemäldegallerie in Brüssel"
label QS:Len,"The archduke Leopold William in his paintings gallery in Brussels"
label QS:Les,"El archiduque Leopoldo Guillermo en su galería de pinturas en Bruselas"
label QS:Lfr,"L'Archiduc Léopold-Guillaume dans sa galerie"
English: The Archduke, wearing a hat, is showing his pictures, almost half of them by Titian. Other Venetians represented are Giorgine, Antonello da Messina, Palma Vecchio, Tintoretto, Bassano and Veronese; there are also Mabuse, Holbein, Bernardo Strozzi, Guido Reni and Rubens. The sculpture supporting the table, is Ganymede, a bronze by Duquesnoy the Younger. Four gentlemen, are with the Archduke, one of whom is Teniers, his court painter. as a present for Philipp II. 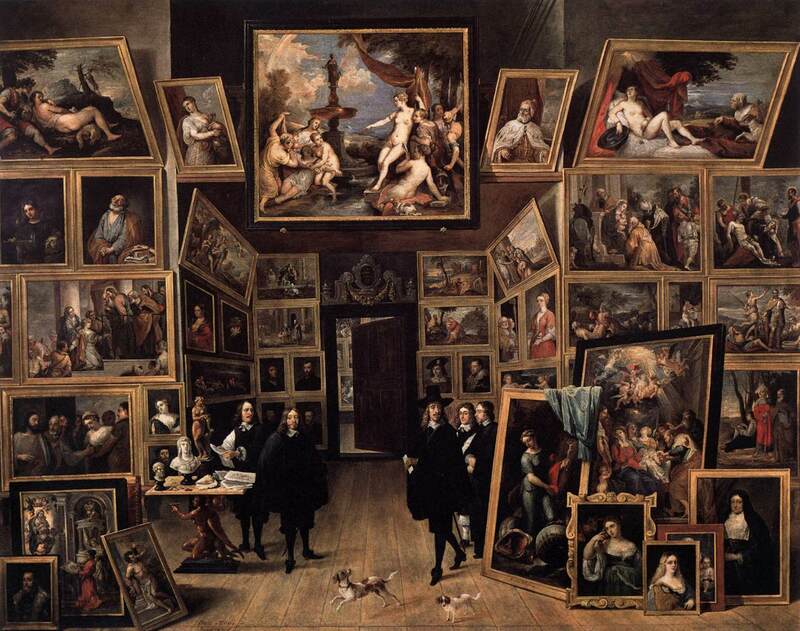 Media in category "Archduke Leopold William in his Gallery at Brussels (Prado)"
This page was last edited on 20 February 2019, at 13:37.